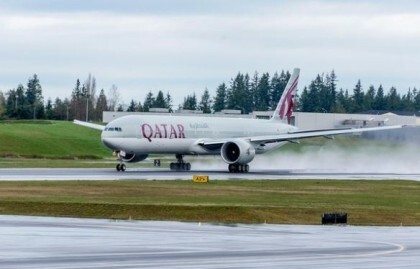 “We’ve officially landed in New Zealand, the `Land of the Long White Cloud,’’’ Qatar Airways tweeted, as the 16-hour-and-20-minute-long flight from Doha arrived in Auckland, after passing over 10 time zones and five countries, covering a distance of 14,535 kilometres. The Boeing 777-200LR received the traditional welcome for inaugural flights, with a water cannon shower by the airport’s fire and rescue teams. Air India also claims to offer the world’s longest flight, at 15,300 kilometres, from Delhi to San Francisco. That flight, however, adds 1,400 kilometres to its journey to use favourable tailwinds, according to the Times of India. Doha and Auckland are further apart than Delhi and San Francisco. Singapore Airlines plans to resume its 15,344-kilometre, 18.5-hour non-stop flight from Newark, New Jersey, to Singapore in 2018. The Qatar Airways flight, according to the airline, is operated by four pilots and 15 cabin crew, who serve around 1,100 cups of tea and coffee, 2,000 cold drinks and 1,036 meals during the journey. New Zealand Trade Minister Todd McClay welcomed the inaugural flight, saying the service would boost trade and tourism. “The new Auckland – Doha service will not only provide more options and connections for business and leisure travellers, but will also provide an additional 116 tonnes of freight capacity every week,’’ McClay said in a statement. “This increased freight capacity will support New Zealand exporters getting their fresh product to the Middle East and beyond,’’ he said. The daily service provides a weekly freight capacity equivalent to 1,162 sheep, Qatar Airways said.